I never buy cookbooks, but Ralph gets them for me and I have a dozen cookbooks that are collecting dust on my bookshelf. 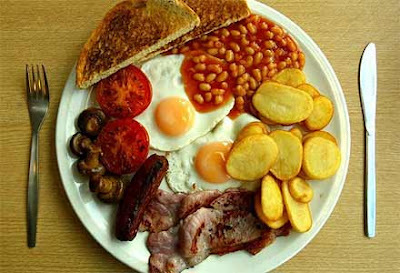 I usually flip through them for the mouth-watering and eyes-widening pictures! Food is so beautiful when it's colorful and well plated. By the way, have you heard of the big fat duck cookbook which is a 532 silver-paged cookbook written mostly by Blumenthal? This book is simply amazing and beautiful. It is not only a cookbook that consists of the most inspiring and delicate dishes it is also an intriguing story about the history behind the Fat Duck and furthermore there is an amazing chapter about the science behind the food and the dishes - the science that sets the bar for modern and brilliant cooking. Flipping through its pages is a tour through an art gallery, with each painting featuring a "how I did it" magician's explanation. 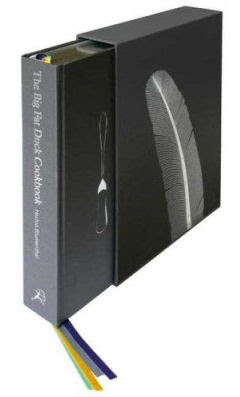 Even if The Big Fat Duck Cookbook looks like an ugly duckling, the exceptional quality of the contents shows it's actually a swan, and a pretty impressive one at that. Heston Blumenthal is widely acknowledged to be a genius, and The Fat Duck has twice been voted the Best Restaurant in the World by a peer group of top chefs, and has 3 Michelin stars! In case you didn't know, he hit the headlines with his curious menus which include sardine on toast sorbet and salmon poached with liquorices alongside snail porridge and bacon-and-egg ice cream. 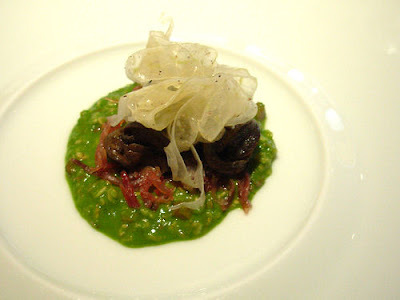 What's your thoughts on snail porridge? but, bacon and egg ice cream? Hmm what a taste-clashing style huh!!! hehe I love interesting PB! woo-hoo! This one RM PB? SO cool eh? I don mind porridge but don go out of my way to eat porridge..if got then eat la ha ha! LJ wan to eat the snail porridge?? I see it Mon!!! First time it appeared in ur comment box eh???? He he… I bought this new brownies from Giant and it’s not bad la…frozen so can heat in microwave or eat it cold… so nice la! Local some more lol…. yeah first time it appeared in my comment box! but why Guest? LOL! Dunno…some more u edi logged in right?? What happens when u go to ur comment box and reply from there?? Guest oso? H eh e..but still guest? If u go to ur JS settings, ur already logged in or need to login again? Very the strange hahahhahah, dropped 220 edi for meows! Wah this one says Monica not Guest…! Dats why, what did u do eh?? Finally u can comment from email yay! So ur using gmail to reply??? So far so good then Mon! Yay, my comments came in edi he he! So no problem woo hoo! Yeah sometimes the comments come in late, phew! Hope you are doing great. Your displayed pics sure look yummy....even though I am quite adventurous in food, but there are still some I dare not take, not snail really! Love Thai food, Mexican fagitas, Chinese food, Italian and many more, Malay food love the rendang so much!!! Perhaps one day I will post the recipe for you guys. Monica happily replying by email it seems yay! Yay! Im dropping ec now! LOL…are we gonna be dropping ec forever or what? Everyday oso drop lol.. I told him u drop 900 and he was shocked hahaha! AIyooooo so funny la R shocked at me dropping 900 hahahhahahhahhaa! LOL tell him I multitask like a mad panda to get everything done he he! He he… but not everyday can reach 900 of coz… today connection slightly better than past few days phew! the snail porridge doesn't sounds too good to me. count me out Mon. Last buzz2 before I sleep sweetie, done dropping too. Nite nite! Why u cant zzzz? ZZZ la!